SunDestin 1009 - Book your spring getaway! SunDestin Beach Resort 1009 is professionally managed by ResortQuest by Wyndham Vacation Rentals. 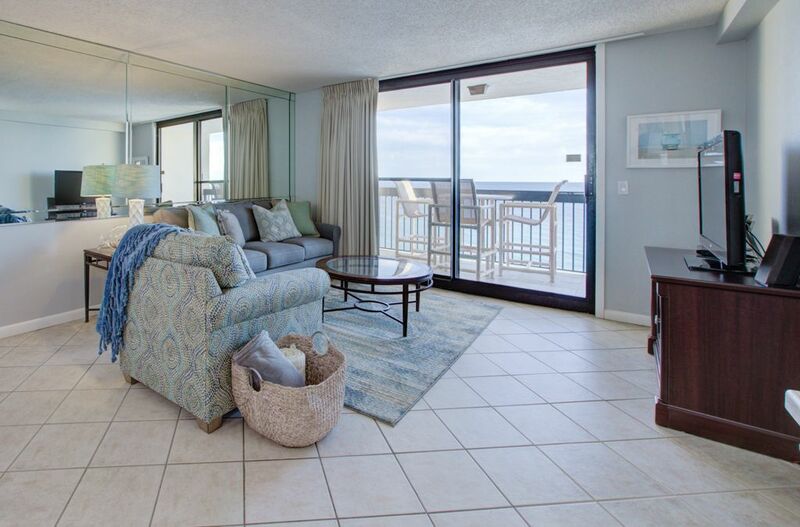 This delightfully styled vacation getaway is located at Sundestin on the beach in Destin, Fl; featuring a unique area rug covering the tile flooring in the living room and tile flooring is located throughout the unit excluding the master bedroom. Watch the planes fly by from your gulf front private balcony by a leisurely walk through the balcony door located in the living room. Other unique features included in the rental unit are open countertops, full-size refrigerator, microwave, stove, oven, dishwasher, toaster, dishes, pots, pans, and utensils, so you can cook your favorite meal and watch the beach. The bathroom includes two toilets, two vanities, and a tub/shower combination. The dining table seats up to four people easily for any card/board game or dining. This unit also features 2 TVs, 2 DVDs, and a CD stereo system. All Sundestin units, balconies, and common areas are smoke-free. The property offers a smoking area for our guests who smoke to use during their stay. My family and I were very pleased with the condo. Everything was clean and accessible. The view of the beach was stunning and the best part of the whole place. The location was great and close to everything. The have complimentary DVDs for guests and the TV worked great. They have an outdoor and indoor pool along with a hot tub. We will definitely be staying here again! Daniela, we are so happy to hear you enjoyed your stay at the Sundestin Beach Resort! Your guest experience is our top priority. Thank you for taking the time to write a review about your vacation after you returned home. We hope you are able to visit again soon. Beautifully renovated condo and lobby area, convenient poolside bar and beach drink service. Beautiful condo w/ perfect view - (no view of neighbors). Busy season but all in all well organized/maintained. Front desk and concierge very helpful. Movie box and on-site casual restaurant/bar were convenient. Walking distance to Back Porch restaurant, easy drive to local attractions. Would stay again. Thank you for taking the time to tell us about your stay at Sundestin. We are committed to making sure our guests have positive beach memories for years to come, and we look forward to the opportunity to serve you again.